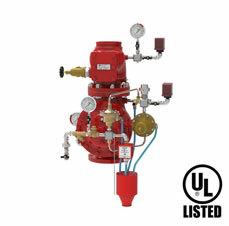 Pre-Action fire sprinkler system uses concept of having dry pipe sprinkler system. 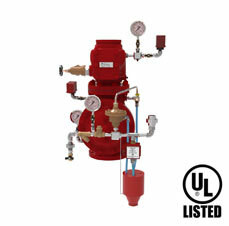 Water is withheld from sprinkler piping by a Pre-Action Valve. 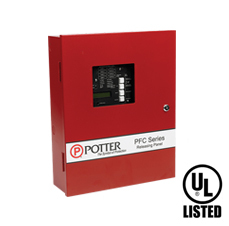 Pre-Action system generally requires two separate fire detection signales in order to operate. 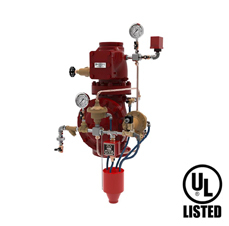 Thus the systems are effectively designed for water sensitive areas that require protection from inadvertent water flow into the sprinkler system piping. 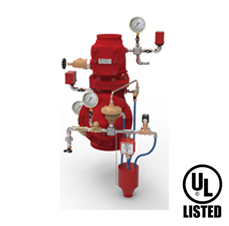 HD Pre-Pack is a pre-assembled Pre-Action System enclosed in a self-contained cabinet while HD Pre-Action systems can also be skid mounted. 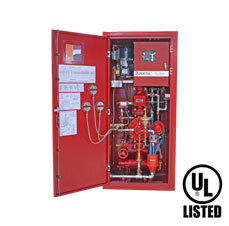 It is UL Listed and can be configured as single or double-interlock with several options. 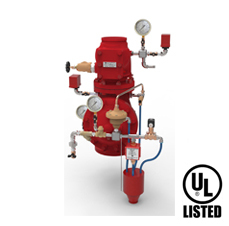 The system typically consists of HD deluge pre-action valve, riser check valve, pre-action trim, fail safe valve, butterfly valve, pressure switches, solenoid valve, air compressor and a releasing panel. Please refer to product catalogues for approval information, technical specifications and ordering information.